A warm welcome to Hong Kong Women in Publishing Society (WiPS). We are a group of women based in Hong Kong (or who have a HK connection) who are either involved in or interested in some aspect of publishing. We’re writers, writers-to-be, poets, artists, illustrators, editors, proofreaders, copywriters, graphic designers, journalists, publishers, fiction or non-fiction authors or quite simply women who wish to become involved in some way with the publishing world. Always wanted to see your name in print? Now’s your chance. Here at WiPS, our members have the opportunity to be published each year in IMPRINT, our annual anthology (sold at most major bookshops in Hong Kong). Or order from WiPS: Copies can also be ordered direct from us. For delivery right to your post box contact: wipshk@gmail.com. Imprint 17 was launched in April. The anthology makes a GREAT Hong Kong souvenir present for family and friends. Imprint 18 will launch on Friday, 26 April 2019! Read more about Imprint here. 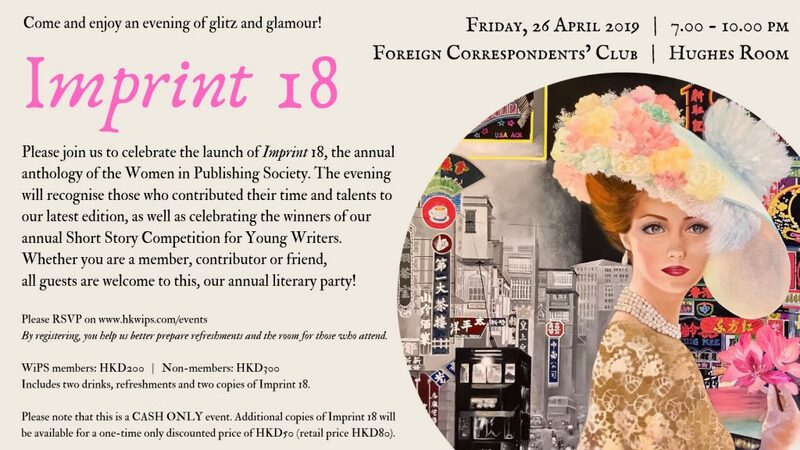 Women in Publishing Society Hong Kong (WiPS) will announce the winners of the Short Story Competition for Young Writers 2018 at the Imprint 18 launch. We will announce the theme of the next competition in September 2019.